A real, immersive, believable virtual reality experience is kind of like the elusive pink unicorn of the gaming world: you can look for it all you want, but chances are you’ll never find it. An Austrian-based company called Cyberith may just turn out to be that unicorn. Its omni-directional VR locomotion platform is maybe the most comprehensive and and complete device of its kind to hit the market. The Virtualizer is compatible with gaming devices like the Oculus Rift, Kinect, and Wii. Put on a head-mounted display and some surround-sound headphones, grab a motion-detecting controller, and strap yourself into the Virtualizer and you are more or less inside the virtual world. 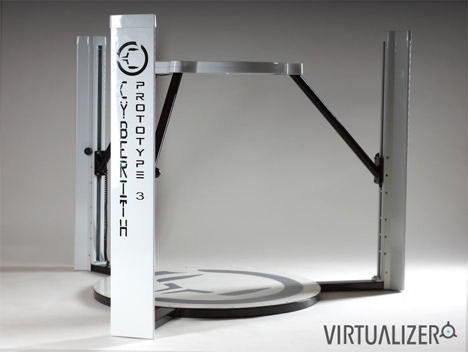 The responsive Virtualizer platform lets you walk endlessly in 360 degrees by just leaning forward, backward, or to the side and walking naturally. 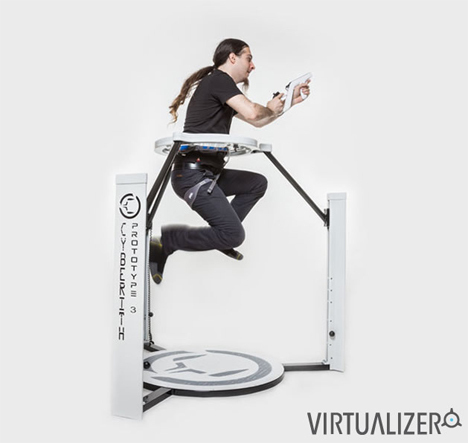 Unlike a lot of comparable devices, though, the Virtualizer also recognizes your movements when you jump or sit. That means that when you take control of a tank, you can actually have a seat and drive the tank around. 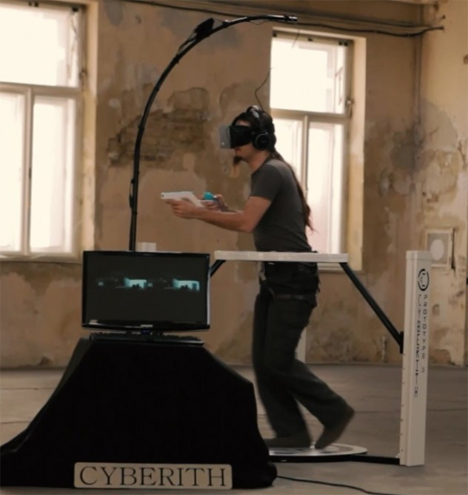 Cyberith have added in the useful feature of haptic technology, which allows you to physically feel what’s happening around you in your game. If a grenade goes off near you, the system lets you feel it. Not in a violent or painful way, of course – just a big vibration to let you know that virtual danger is near. The Virtualizer is definitely one of the most impressive immersive gaming experiences created to date, but there is still room for improvement. The company is already looking toward the future and planning to add functionality that can make the gaming experience even more real. But the Virtualizer is no one-trick pony; the company envisions it being used in virtual tours, training, and educational settings. As of the time of publication, the Kickstarter campaign was very near its funding goal, so soon your first person shooter games will get a whole lot more real. You can get your own starting at $749 before the Kickstarter campaign ends.